Not combinable with other offers and discounts! 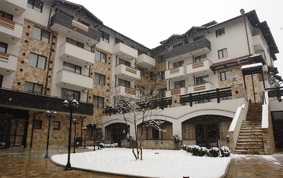 Location: Dream Aparthotel is located in Bansko ski resort at the foot of the Pirin mountain, close to the Gondola ski lift station. - 50 Delux Suites – living room with kitchen box, bedroom, bathroom with bathtub. It accommodates 2+2 with a complementary bed in the living-room. - 14 Grand Tower Suites – two-floor apartment with living-room with kitchen box, 2 bedrooms, 2 bathrooms, one bathtub. It accommodates 4+2 with a complementary bed in the living-room. - 6 Grand Suites – living-room with kitchen box, 2 bedrooms, bathroom with a shower. It accommodates 4+2 with a complementary bed in the living-room. - 4 Tower Suites – two-floor apartment with living-room with kitchen box, bedroom, 2 bathrooms, one of which with a bathtub. It accommodates 2+2 with a complementary bed in the living-room. - 4 Studio apartments - room with a kitchen box, double bed, extending couch, bathroom with shower. Each apartment features cable TV, telephone, Internet connection, safe, kitchen utensils, refrigerator, balcony, bathroom and hair dryer. Bars and restaurants: Dream hotel offers a first class restaurant with a chef from England. The restaurant features 3 separate rooms with different interior and live music. Each Saturday the restaurant offers traditional Bulgarian night. The restaurant is appropriate for business meetings and seminars. The main hall can be used as a modern multimedia presentation conference room with 150 seating places. At guests' disposal is lobby bar. SPA centre: The SPA centre offers SPA treatments and procedures, French cosmetics. modern manicure and pedicure SPA products, as well as covered swimming pool, russian bath, sauna, massages, bathtub for two persons.